A research-based, mixed-methods approach to arrive at the best recommendation for your organization. Disruptive change cannot occur without an understanding of the roots of the organization. 9m's Assessment consulting service evaluates the operational model, culture, team interactions, and leadership behaviors using a variety of approaches. The end result is an assessment report with high-level strategies to enhance innovation performance. This typically takes three weeks to perform the assessment and to compile the findings. Our Assessment model focuses on four key evaluation areas: Organizational Culture, Operational Models, Team Dynamics, and Leadership Behaviors. Within each evaluation area, five key attributes are then analyzed using a variety of methods including: Interviews, Focus Groups, Surveys, Observations, and Market Analysis. 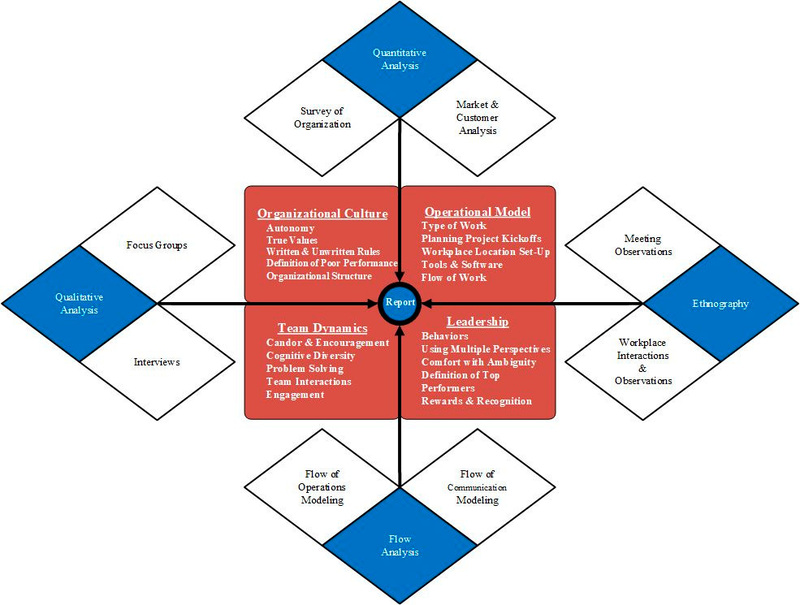 Our Organizational Assessment varies from other models in the field as it is originated on a research-based construct. Breaking the innovation environment into four distinct areas of Culture, Operations, Team, and Leadership the model can dissect each area to determine the positives and detractors of innovation in an organization. Using a mixed methods approach, it incorporates qualitative and quantitative research methods to make the determination.